Few things are as disheartening as the fact that girls from disadvantaged families are missing school because of a process as natural as menstruation. This is due to lack of proper sanitary protection and other than risk what comes to them as shame embarrassment in school, girls who cannot afford to buy pads, or those who do not have enough facilities within the schools to take care of their menstrual hygiene have little option than to stay home. For example, Girls from Ole Sereni Primary School in Narok have for the longest time had a unique problem in that they did not have a completely separated washroom away from the boys in terms of general direction, and this caused a lot of anxiety when they were having their periods. You can imagine that something like going to change their pads during breaktime was a problem because as much as they were not exactly sharing washrooms with the boys, they were pretty much moving in the same direction and only detouring near the washrooms. As if this was not enough, the washrooms were just not enough and sometimes their break times used to get timed out before some of them could get time to follow the long queues to get to the washroom. These are problems that young girls should really not be having heaped onto their young minds. Puberty is a very sensitive time for a young girl, and she needs to be protected from problems such as the above so that she may sail through this tricky time with as much peace of mind as possible. More so because she needs to study and build a future, and at the same time she’s dealing with changes in her physical and psychological growth. It is during puberty that a girl’s self-esteem and confidence in herself and her body can be build or broken and both these scenarios mean a lot to her future and the future of her family and therefore community as a whole. Studies show that over 900,000 girls in Kenya miss at least 4 days of school every month due to their monthly periods. Absenteeism obviously interferes with their learning, their overall performance and education as a whole and this further goes to negatively impact their careers. Furthermore, uneducated women are less likely to educate their girls and this cycle goes on and on to the detriment of the girl child empowerment efforts through education. Disadvantaged families are everywhere and moving over to my home county, meet Beyond Limits Initiative director Jackline Wambui from Mukurwe-ini. 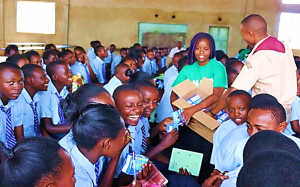 Jackline is a member of the Beyond Limits Board and she realized that girls raised mostly by their grandparents had little or no money to purchase proper sanitary protection during their periods, if at all. This led to the very unfortunate scenario of some girls falling into the trap of sleeping with bodaboda guys, so that they could get even just Ksh.50/- to be able to afford pads. This very unfortunate scenario quite obviously increases the risk of early pregnancy and transmission of HIV. In both cases, that is Ole Sereni Primary School and Beyond Limits initiative, Safaricom Foundation through Ndoto Zetu stepped in to sort out these girls. In Ole Sereni, the foundation built a washroom away from the boys so that the girls have a pace to change, and in Mukurwe-ini, it provided one packet of pads per month for two years to 95 disadvantaged students. In both scenarios, these girls are able to stay in school and study. Storage Is The Most Important Thing When Decorating A BedroomAre You Taking Self-Employment Seriously Enough?